What do kids love to do? Play! So let’s link reading with play in their minds. Let’s Play is perfect for this. Tullet speaks to kids through the yellow dot, which encourages kids to create a line for its amazing journey through the book. The dot prompts children to find a “hidden” dot, skip jump dots, count to 10, (both handy skills for Maths!) and tip-toe past scary eyes in the dark. Youngsters also discover that clapping their hands and saying Za-Za-Zoom apparently rescues dots from a fix. They’ll love the dot’s adventures and I’ll love to think of some youngsters puzzling out exactly how that tricky dot manages to “move”. 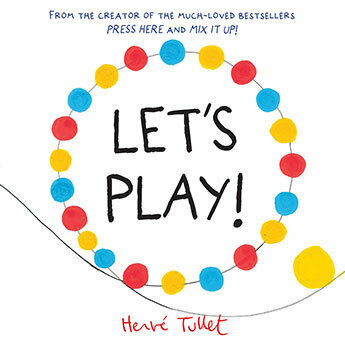 Any children who know the earlier books, Press Here and Mix It Up, will be delighted to discover a new Tullet book. Do seek them all out for your kids. My hard cover copy is RRP: $Au22.99 but it is very sturdy and cleverly made to resist LOTS of re-reading. Can we put a price on kids developing a love of reading? No, it’s priceless!